Study of three green apples in acrylic on box canvas; the image continues around the edges of the canvas so there is no need to frame. 505 mm x 200 mm x 15 mm. I'm personally not a great fan of Granny-Smith apples, they are far to tart for my liking ~ its rather like biting into a lemon. But I'm please to I have also captured a sensation as well as the apples, so that when you look at these your mouth almost starts to salivate getting ready to take a bite! Well, what can I say! The children are back at school now and it has taken me a little bit of time to get myself back into my own little routine! I have been checking up on my blog when I can to see if anybody has had a look or left me a message. Do drop me a line! Otherwise I don't know if its worth sitting down religiously and pouring out my soul ( yes! I'm melodramatic too)! Can anybody tell me if I can add a counter to my blog so I can monitor how many people have tapped into my rambling words? This last week has mostly been taken up with organising a artist Creative Exchange group, and working out all the beginning steps to entice other artists to join in and let it grow. I have also landed myself a fantastic commission to tile around a chimney. Big job for me! I will post pictures as I go along. Talking of posts, what do you make of my latest painting. Please do leave me a message if you are interested in any of my work. That's it for today. Short and sweet! Hope to hear from you soon! 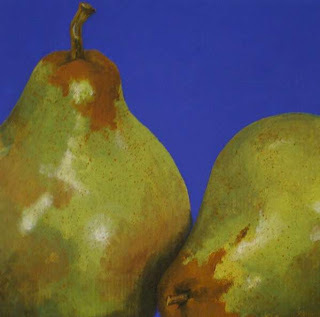 Study of pears in acrylic on box canvas the image continues around the sides, so there is no need to frame. 200 mm x 200 mm x 20 mm. I should never write about my creative block! I haven't been able to get back to writing, painting, potting or anything really. The children are on a mini school break, so time is not my own really ~ I've been getting stuck at every turn. So, today in desperation I am posting one of my first paintings, let me know what you think... but remember, be kind now!!! Its all coming back now since my days at art school (oh! Hark at me! ), like... as I finish each painting I have a small sense of tingling excitement ~ quietly proud, not too cocky. Its funny, I'm having to re-learn all over again how to actually look and observe with my eyes and not my head and then translate that through my hands ~ very different to creating in clay which is imagination rather than observation. But working on my own I always wonder what the public response would be... even though these first paintings are hardly offensive; yes, yes here comes the tough self-critic and self-doubt! So, to keep on the safe side I'm starting with simple still lives, and eventually I’m going to build up to something more emotional, or thought provoking (heaven knows what though)... I always cover all scenarios, as I don't much like failure ~ well who does? I want to achieve so much and do it NOW! The frustration is just humongous! 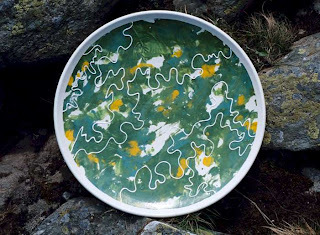 Earthenware platter, in greens and yellow engobes and tube lining. Today I have been thinking a lot about how to develop this blog page. I have started to place images of my work, which seems fine for now. I would like to use this blog by way of a tool to get myself "out there", to sell my work (I'll create a link to eBay soon) and to discover where I am going ~ in creating my own work so to speak. I am suffering from a huge, enormous, great big, mammoth of an artistic block! I thought it was the dreadful post Christmas / New Year gluck.. no mans land... but it still drags on. Plus, geewhillickers my darling children are a big distraction too! So, I don't seem to get a moment to myself to soul search I suppose. I have, how ever, been waisting lots of time on eBay! I discovered a wonderful artist called Sheila Vaughan (please see link) she introduced me to the American painting craze of "A Painting a Day" (again check out the link). So, I decided in this time of desperation to change direction and turn my hands to other creative sources in hope of inspiration. After all when I was at art school, if I lacked direction I just popped through to another art department. So, watch this space. Who knows where this blog and art journey will take me. And maybe you might see something you might like to purchase. 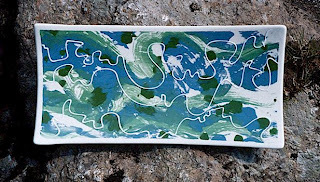 Earthenware slip-cast rectangular platter, decorated with blue and green engobes, tube lining and mother of pearl lustre. 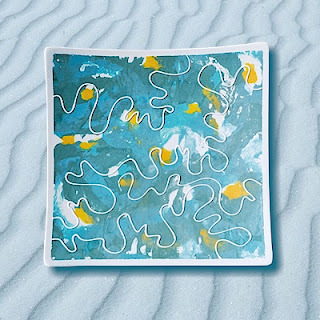 Earthenware slip-cast platter decorated in turquoise & yellow engobes, tube-lining and mother of pearl lustre. 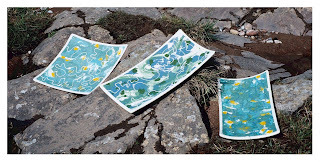 Here are three dishes from my "Ocean Platter" series, which I started making in 2005. Platters vary in size, shape and colour. Each platter is slip cast and decorated with engobes (coloured slips) by painting and printing techniques, then I tube-line thin lines (a bit like piping onto cakes!) to create texture and ripples across the surface. The piece is biscuit fired, then glazed and fired again. Finally I apply lines of silver or gold luster for their reflective qualities and fire the piece once more. It all sounds rather laborious, but definitely worth it ~ each piece has a fluid depth with a wonderful tactile quality.